The iliolumbar ligaments exist bilaterally, and in each side they link the transverse process of the fifth lumbar vertebra towards the ilium. Each ligament expands through the apex of its transverse process towards an area on the anteromedial surface of the ilium along with the inner lip of the iliac crest. The anterior iliolumbar ligament is a strong ligamentous band whose fibers through as far medially as the body of the L5 vertebra towards the apex of the transverse process, emerge via the whole length of the anteroinferior boundary of the L5 transverse process. The fibers from the medial end of the transverse process envelop those via the lateral end, and jointly they all move posterolaterally, in accordance with the long axis of the transverse process, in order to connect to the ilium. The upper surface of this bundle creates the site of connection for the fibers of the lower end of the quadratus lumborum muscle. Extra fibers of the anterior iliolumbar ligament emerge through the very tip of the transverse process and over the apex of the transverse process the ligament creates a very thick bundle. The superior iliolumbar ligament is created via anterior and posterior thickenings of the fascia which envelops the base of the quadratus lumborum muscle. These thickenings are connected in general towards the anterosuperior border of the L5 transverse process near its tipInferiorly, they mix with the anterior iliolumbar ligament to create a trench where the quadratus lumborum emerges. . Lateral towards this, they divide in order to move specifically in front of as well as behind the quadratus lumborum muscle to connect ultimately to the ilium. The posterior iliolumbar ligament emerges via the tip as well as posterior border of the L5 transverse process and enters within the ligamentous area of the ilium behind the beginning of the quadratus lumborum. The deepest fibers of the longissimus lumborum emerge via the ligament in this area. The inferior iliolumbar ligament emerges from the lower border of the L5 transverse process and through the body of L5. Its fibers pass throughout the surface of the anterior sacroiliac ligament downwards and laterally to connect to the upper and posterior part of the iliac fossa. These fibers are differentiated through the anterior sacroiliac ligament by their oblique positioning. 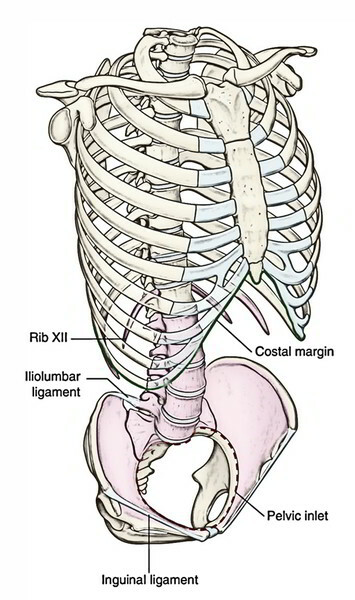 The vertical iliolumbar ligament emerges through the anteroinferior border of the L5 transverse process and comes down almost vertically to connect to the posterior end of the iliopectineal line of the pelvis. It creates the lateral margin of the channel where the L5 ventral ramus goes into the pelvis.